Middlesex University students through to the Institution of Mechanical Engineers’ Design Challenge National Final after their robot wins London heat of the engineering competition. A team of first year engineers from Middlesex University have been crowned winners of a robot design competition after battling it out against other London universities. The students claimed first place in the Greater London Regional Final of the Institution of Mechanical Engineers' (IMechE) student Design Challenge – a competition designed to give engineering students experience of the challenges they may face in their future careers. Piotr Nowicki, Jerome Samuel-Clarke and Joslyn West are all students on the BEng Mechatronics degree course and entered the competition as part of their first year studies. They will now go up against universities from across the UK at the national finals in October. For the regional final students had to design, build and race a self-contained robotic machine capable of climbing and descending a 2.5 metre-tall copper pipe in the shortest possible time, using a small battery-powered electric motor. "We were nervous at first because we were unsure whether or not our robot would climb the pole, but once it worked the first time I think we all knew we would win," said Jerome. 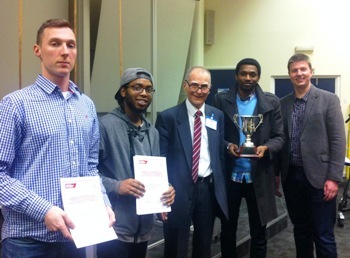 Their creation beat the robots of nine teams from universities including University College London, Brunel, Kingston and Greenwich, with the team picking up a cash prize of £500 for their victory. "It feels great to win. This is the first 'big' thing I have won so it will look good on my CV. I often tell my classmates that if you're not first you're last, so I'm glad our team won," Jerome added. Over three heats and a final at Kingston University, the Middlesex robot recorded the fastest time of 5.06 seconds, and the team are now looking forward to the finals, which take place at the IMechE headquarters in Westminster, London. "The national finals will pitch the Middlesex team against universities across the country," said Middlesex University Professor of Robotics Martin Smith. "It will be a tough challenge, but I am confident that the team will do well in the national finals."